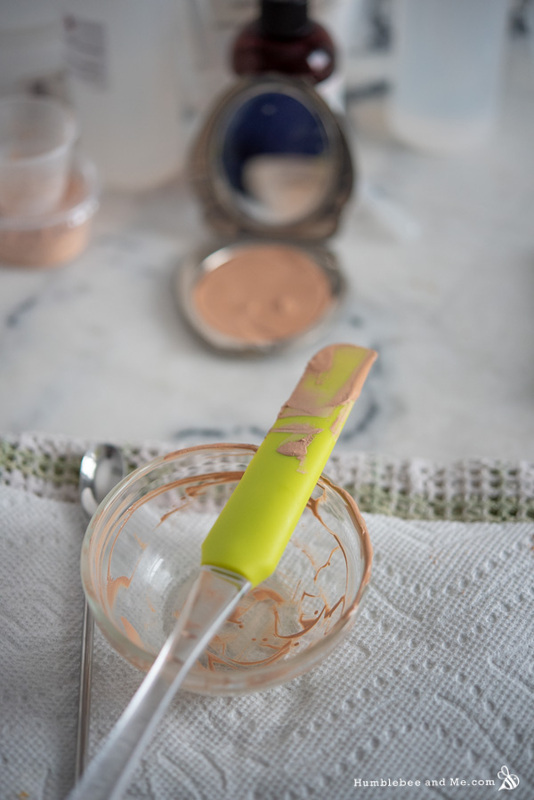 The colour and coverage in this Silky Cream Foundation comes from your already-completed mineral makeup from the recipe in my book, Make it Up: The Essential Guide to DIY Makeup and Skin Care. 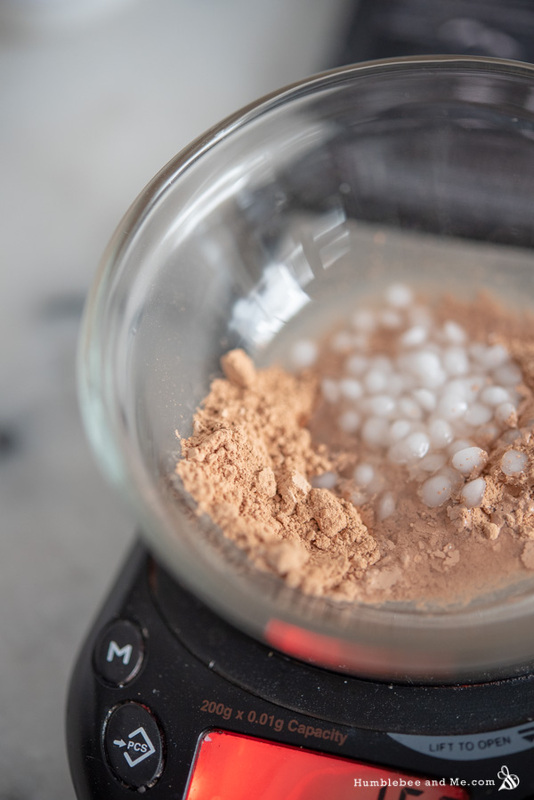 Since you’ve already done the colour blending and matching there it means this foundation comes together very quickly, and since the completed mineral makeup has already been thoroughly blended in a coffee grinder the powder is very evenly blended and incorporates into the rest of our base very easily. I chose cetearyl alcohol as our thickener so we could have rich-yet-lightweight thickening without any wax. I wanted something a bit heavier than cetyl alcohol, but not quite as rich as stearic acid. If you don’t have cetearyl alcohol I’d recommend trying a blend of cetyl alcohol and stearic acid to get a similar effect—start with 50/50 and adjust as necessary. For liquids I chose two lovely lightweight emollients—C12–15 Alkyl Benzoate and Neossance® Hemisqualane. Skin-feel wise they’re very similar to one another and you could easily use all of one or the other if that’s what you have, but I have both and I’m enjoying playing with them! They both have great slip and wonderful spreadability, making for a very silky feeling foundation that blends beautifully. I’ve also included some dimethicone 350 for extra creamy slip. Last but not least, I’ve also included some OptiBlur Elastomer from LotionCrafter. They describe it as “a viscous, high molecular weight combination of dimethicone, beeswax, and cosmetic powders designed to create luxurious products that include optical blurring and soft focus properties, such as color cosmetics, facial products, and moisturizers with a unique velvety texture and matte finish.” It comes in a jar as a soft semi-transluscent clumpy-ish soft solid. Thanks to its high silicone content it has a really rich slippy feel, and it offers some serious optical perfecting powers. I love how it helps obscure fine lines and pores, making makeup look more real and skin more perfect. It also helps offer a bit of oil control and improve the overall feel of the foundation. I’ve been experimenting with it in quite a lot of foundation type projects I’ve been working on over the last year or so, and I’d really recommend getting some if you like making your own foundation. The finished Silky Cream Foundation is stunning. I can’t decide if I like it better in a compact or a stick; the stick is insanely easy to apply with a kabuki brush in one hand and the stick in the other, but the compact is also crazy simple and I’m loving getting to use some of the beautiful vintage compacts I’ve collected over the years (watch for them at flea markets and vintage shops!). 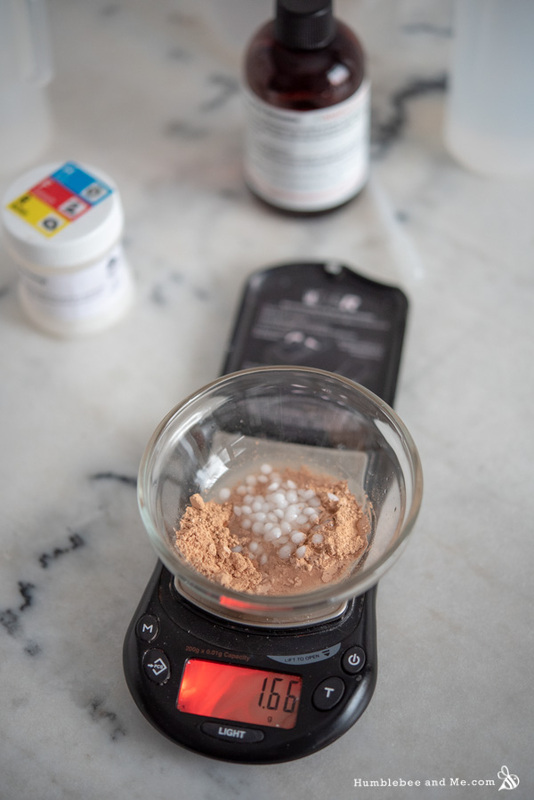 Weigh the heated phase ingredients into a small, narrow container—I recommend a 50mL beaker. If you’re going to use a small electric mixer to blend everything together (highly recommended) you’ll want to make sure you can corner the (relatively small amount of) melted liquid and not spray it everywhere. Place the beaker in your prepared water bath to melt everything through. Once the mixture has melted, add the cool down phase and quickly blend to combine. I recommend using a small electric mixer to get this job done quickly and efficiently. 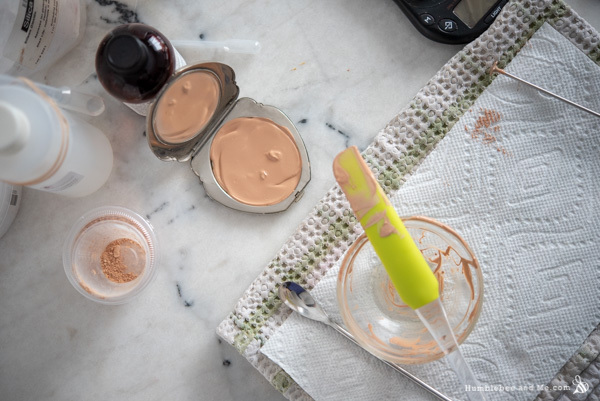 When the mixture is uniform, quickly transfer it to your container—either a flat makeup compact or a twist-up tube. 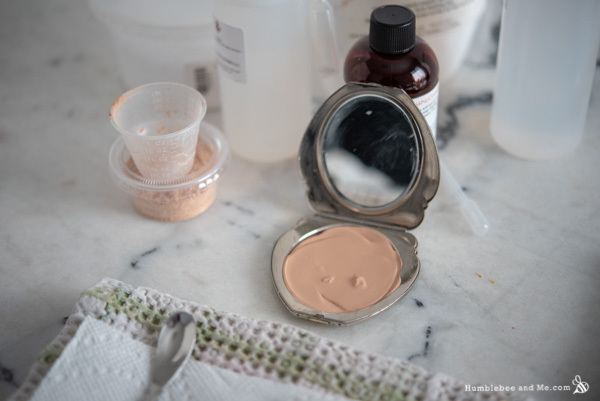 If you’re using a compact I’d recommend pre-heating the metal dish of the compact with a hair dryer so the melted makeup doesn’t solidify on contact, making it difficult to get an even pour. Let the mixture solidify, and you’re done! To use, spread some makeup across your face (straight from the tube or with a brush) and blend with a kabuki brush as required. 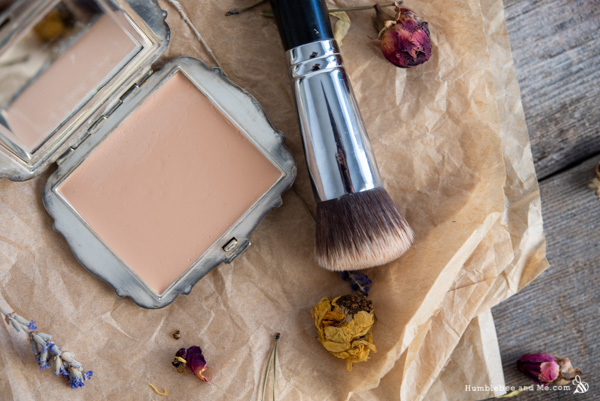 Because this cream foundation is 100% oil based, it does not require a broad-spectrum preservative (broad spectrum preservatives ward off microbial growth, and microbes require water to live—no water, no microbes!). Kept reasonably cool and dry, it should last at least a year before any of the oils go rancid. If you notice it starts to smell like old nuts or crayons, that’s a sign that the oils have begun to oxidize; chuck it out and make a fresh batch if that happens. As I’ve provided this recipe in percentages as well as grams you can easily calculate it to any size using a simple spreadsheet as I’ve explained in this post. As written in grams this recipe will make 10g. You could probably try a store bought mineral makeup if that’s all you have, though that will make this recipe significantly more expensive. If you don’t have cetearyl alcohol I’d recommend trying a blend of cetyl alcohol and stearic acid to get a similar effect—start with 50/50 and adjust as necessary. If you don’t have both C12–15 Alkyl Benzoate and Neossance® Hemisqualane you can use all of one or the other. For further substitution suggestions, please review their encyclopedia entries. I would also recommend reading up on the OptiBlur Elastomer as it has some solubility requirements as well, so not all possible alternatives are sure to work with it. You can try replacing the dimethicone with a natural silicone alternative like LuxGlide 350, or a very slippy oil. I have no good suggestions for replacing the OptiBlur Elastomer. I’d probably start with 4% silica microspheres, 2% cetearyl alcohol, and 8% more of either C12–15 Alkyl Benzoate or Neossance® Hemisqualane. I have not tested this, but the silica can bring some of the oil control/blurring while the cetearyl alcohol will help make up for the slight thickening the OptiBlur contributes. The C12–15 alkyl benzoate was gifted by Essential Wholesale. Very excited to try this recipe! Also, Lotioncrafter carries the C12-15 Alkyl Benzoate 16 oz for $9.45 usd vs Essential Wholesale 16 oz at $21.25 in case anyone is looking for other sources. I checked the INCI on Lotioncrafters Ester AB product and it reads C12-C15 Alkyl Benzoate. https://bit.ly/2TZP99m That is the url data shortened by Bitly to get to the Lotioncrafter product. Anyhow, I love those vintage compacts and again excited about this recipe! Thanks for the tip & the link, Jamie! I hope you enjoy the foundation when you get a chance to make it 🙂 Happy making! Do you have a recipe for a bronzing gel. I’ve been looking at your recipes for a while & think what you achieve is amazing! I’ve recently been diagnosed with a fragrance allergy so I can no longer use the only moisturiser that’s suited my skin…Nivea Cream. My skin is hating everything else I try . I was thinking about trying to make my own cream based on the Nivea recipe but have no idea of what quantities to use. I was considering omitting the water too so avoid adding a preservative while my skin heals. Could you possibly help? I’m truly desperate! Thank you so much, Julie! I’m afraid my familiarity with Nivea cream is non-existent other than reading the ingredients online just now, so I don’t know a whole lot about it. If you’ve never made lotion before I’d start here to get the hang of it before moving onto ingredients with fancier ingredients. I wouldn’t ditch the water—water is so good for helping our skin heal! Perhaps take a look at my soothing series? There’s a facial lotion, and no added essential oils or fragrance (though there are hydrosols, which you may wish to replace with distilled water). Best of luck and happy making! YAY! I am just putting together a lotioncrafter order so I can add those things! So excited for this recipe. Woohoo! There’s few things quite as exciting as having a new Lotion Crafter order on the horizon 🙂 Happy making! Yay! I’m so excited! I’ve been waiting for this one! What other products are you wearing? The blush is perfect for your skin tone! Unfortunately I have yet to find an emulsifying wax that does not contain palm products. I just spent a few minutes searching how some ewaxes are made. One of my favourite ewaxes that so many love to say is safe, environmentally kind; Olivem 1000, might actually/probably be made with palm oil. The INCI of Olivem 1000 is Cetearyl Olivate (and) Sorbitan Olivate. Cetearyl Olivate is an ester of cetearyl alcohol and some of the fatty acids are derived from olive oil. Looking further, cetearyl alcohol is predominately a mixture of fatty alcohols consisting of cetyl and stearyl alcohols that are found in plants, like coconut and palm oils. So even the ewaxes tooted to be natural, or naturally derived, or even palm free, may not all be as true as we’d like to think they might be. Just be sure to always do your checking and background checks on each and every ingredient then follow up with your suppliers. One of my favourite cosmetic chemists says it much more eloquently than I ever could. She has written many articles about palm oil and sustainable palm oil on her blog, “Realize Beauty“. Just in time for my first ever LotionCrafter haul!! I’m just waiting for them to restock some things…I’m so excited haha Do you have any recommendations for anything that I must get from them? Hmmmm oh dear, ha. I love their long metal spoon/spatulas, their blood orange hydrosol, hydrolyzed rice protein, LMW hyaluronic acid, the new CosQ10 Max I used recently… so many things, really 😛 My apologies to your pocketbook! I have literally 34 things in my cart right now…And I’m waiting for 4 more to restockGuess this is how my first check is spent on haha:P Also should I get the Micromini mixer or the mini mixer? I have a suggestion for transferring the makeup to a compact. This will only work if the metal pan can come out of the compact container. I use this technique when transferring lipsticks out of the tubes too. Take the pan that you want the make up to go into. Place on an electric mug warmer. Let the pan heat up a bit. It doesn’t take long at all, about a minute. Then pour the makeup into it. The pan will be warm so the product will not cool when placing into the container. Carefully remove the pan off the mug warmer. I’ve been trying various foundation recipes from the internet for ~5 years and purchased your book the week it came out (awesome book btw). I was super-excited about this recipe until I discovered that the only ingredients I currently have are mineral makeup and vitamin E oil. Digging deeper into the recommended substitutions and your encyclopedia pages, I see that I can blend cetyl alcohol and stearic acid (2 ingredients I do have) as a substitute for cetearyl alcohol. Makes this recipe seem much less accessible than most on your site. Will there be more recipes using Optiblur Elastomer and C12-15 alkyl benzoate in the future? I’d had to spend the money and only use them for one thing. 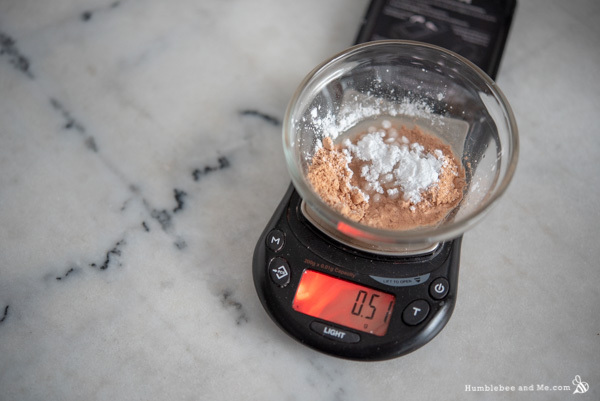 In my personal experience, when I buy a new ingredient that I do not know, I take the smallest quantity available. Often I’ll buy it for a specific recipe (like Marie for exemple) or some other source material, but then I experiment with it myself. The suppliers often give very good indications on how to use these ingredients. You know, Marie is very generous with her time / knowledge, she does not force anyone to buy ingredients, and you should not rely on HER next recipes, that she shares for free with us, to spend your ingredients. I suggest you do your own research. Thanks for your feedback. Firstly I will apologize to anyone who may have found my previous comment rude or unkind. I agree with you whole-heartedly that Marie is generous with her time & knowledge. I should not take that for granted. Second, your approach to buying unfamiliar ingredients is similar to my own. I do buy the smallest quantities, read the supplier’s usage notes and do my own research (including non-“Humble Bee & Me” websites). I don’t buy ingredients unless I have a few recipes/ideas to try out. By recipes/ideas I do include my own experimentation. I had already done some research and had an idea for other things to do with OptiBlur and C12-15 Alkyl Benzoate before I submitted my previous comment. Third, I don’t rely on Marie’s recipes to spend my ingredients. 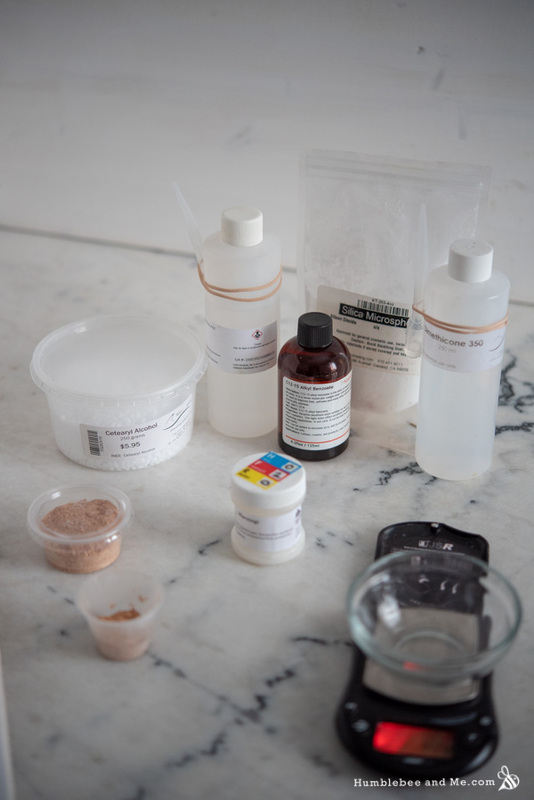 I’ve been crafting my own toiletries and makeup for years before I found this blog. It’s one of many great resources out there. I posted the question about future recipes purely out of curiosity. Finally, I will remember how tactful your reply to me has been and will avoid leaving comments that could be hurtful in the future. Hey Tanya! 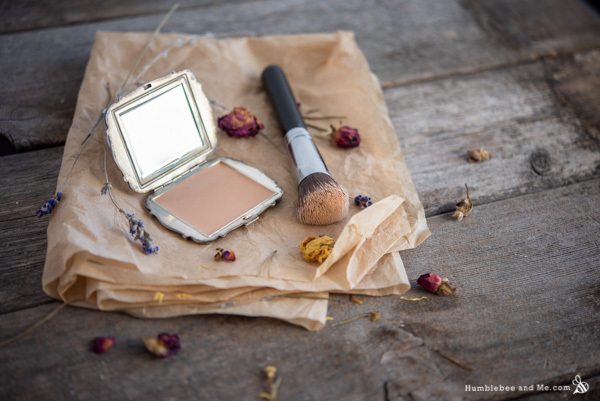 Something I enjoy doing on the blog is sharing makeup formulations that are much more complex than the ones in the book; a core focus of the book was doing as much as possible with the shortest possible ingredient list. I enjoy not doing that every so often on the blog. Since you have the book, if you’re not looking to invest in extra ingredients you always have the option of making the recipes in there 🙂 If you watch the video I also discuss this there. Hey Carol! I’m not sure this is the formula for you—I’ve found it can settle into the smile lines around my eyes a bit as the day goes on, depending on how much I apply in that area. I think I need to do some more research in this area, and find myself some testers with more diverse skin 🙂 I do have a different, liquid formulation in progress as well, and I think that one might be better suited. Stay tuned, and thanks for DIYing with me! 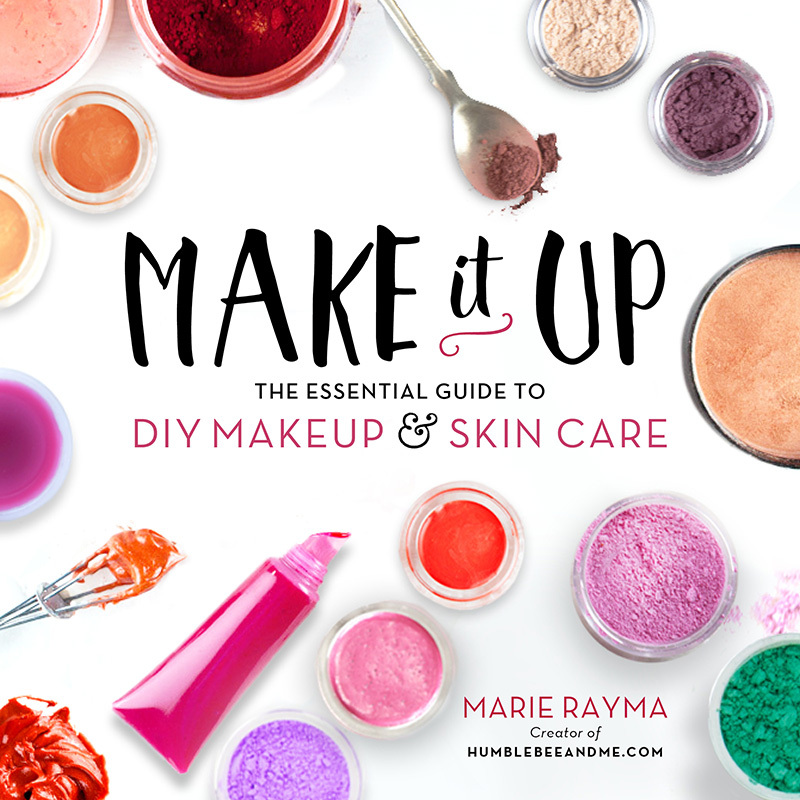 Having “mature” skin myself, I’ve found that the mineral makeup I make from Marie’s book to work better than a store bought cream foundation. I found the cream foundation to really settle into places I didn’t like. 🙂 Will look forward to Marie’s experiments with this! Great recipe 🙂 I don’t have Optiblur so have used Wrinkle Blur from Making Cosmetics and it’s worked very well. 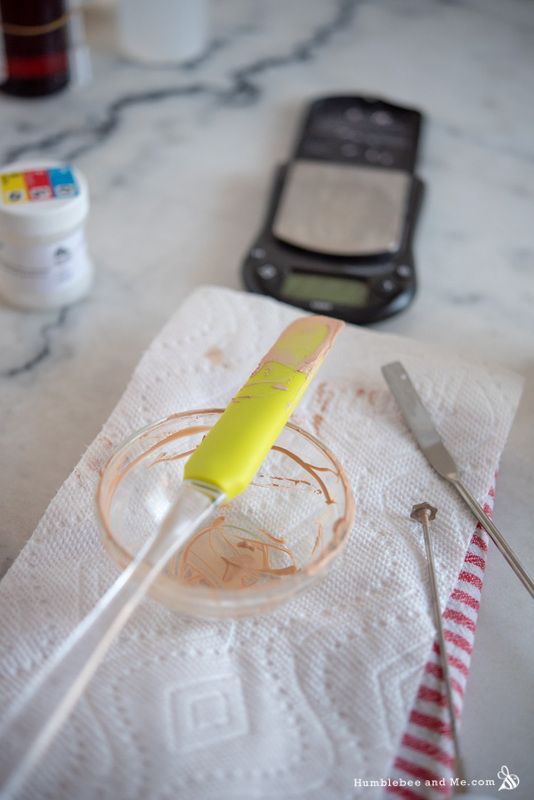 I’ve only made a 5g sample as I didn’t want to use all my mineral blend but next time I will make some adjustments to make it slightly more moisturizing – the Wrinkle Blur lacks the beeswax that’s in Optiblur but beeswax won’t be my first choice for increased moisture. I’m going to have a lot of fun with this one. Thank you! All I can say about your comment is…. where can I get me some pictures of your final product????? And talk to me about this Wrinkle Blur! What is it like? How do you find it? Does it work as well as claimed? So I just made this, and WOW, the finish is amazing! I plan to wear it tomorrow and can’t wait to see how it wears. Thanks for the great recipe! Glad you are loving it! Don’t forget to share pictures on Instagram! Any suggestions on where to purchase an empty compact? My vintage ones have been from a smattering of places, though the majority of them are from a small stall in Camden Market in London, which I realize is not terribly helpful if you don’t live there! If you’re looking for vintage ones I’d probably check out eBay and any local flea markets/antique stores you have. They can get stupidly expensive depending on the source; I remember finding one at a flea market in Florence that was something like 90€. Pffft, nope. Most of the ones I got in London were in the 10–15£ range. Hi, I’m wondering if you think this is an acne safe product? Your question is a truly hard one to answer. And no one really likes the answer for it really sounds wishy washy. Bottom line is it depends. Everyone’s skin is different and what works for some peoples’ acne and acne flare ups, may not work for anothers. 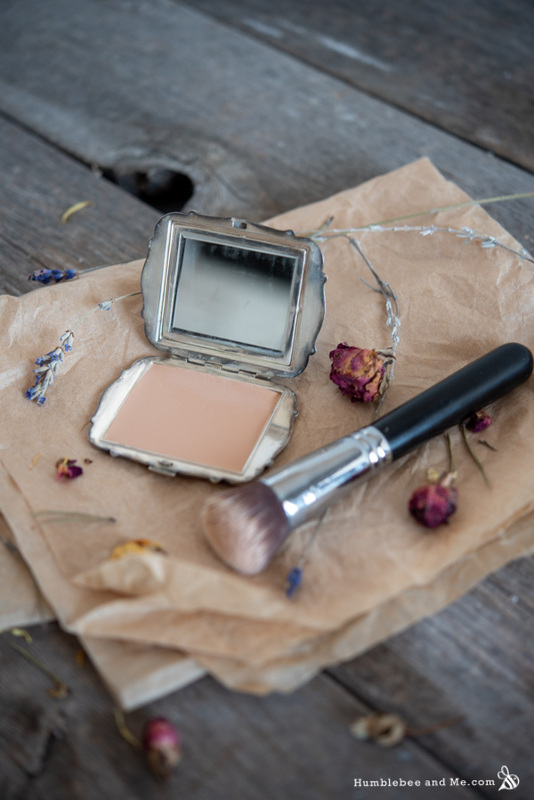 It’s a lot of trail and error when it comes to skin care! I’m truly sorry I cannot give you a straight answer on this one!